Your furnace or air conditioning system may be sucking in deadly gases (carbon monoxide, radon, etc.) as well as dangerous chemicals, allergens, and pet dander. The Department of Energy Says - "Cover/seal furnace filter slot to eliminate air leaks." 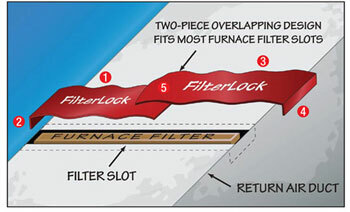 The FilterLOCK is placed over the filter slot (or any seams in metal ductwork) to eliminate the entry of unfiltered air into your forced air system. Millions of homes have open filter slots needing FilterLock to seal, save energy, and improve indoor air quality. Effective and simple invention! I used to use masking tape to stop dust infiltration around the filter slot. It was difficult to replace the tape with each new filter. It is easy to put this seal off and on with each filter change. I had a home energy audit done and this was described as "low hanging fruit" meaning the easiest way to improve the efficiency of my heating/cooling of my house The filter lock was easy to install. It prevents cold attic air from getting pulled into the system and in the summer it will prevent super hot attic air from having to be cooled. It's a great idea and a great product. This is super easy to install. It came in two parts with magnetic sides which overlap on top of the opening for the furnace filter. It fits perfectly and it will be easy to remove and re-attach every month when we change the air filter. I was told by a heating/air serviceman that I needed a new filter housing custom built because the filter slot was too large. This product saved me hundreds. The filter slot is now completely sealed keeping dust and debris out of my furnace. Thank You discount filters. This was suggested during checkout. I'd never seen these before. Reasonably priced. Easy to use.